Sometimes grey just doesn't cut it. Or beige for that matter. Sometimes when a neighborhood needs an uplift, boldness is required, and color can be that integral component that awakens a place and makes people see it with new eyes. 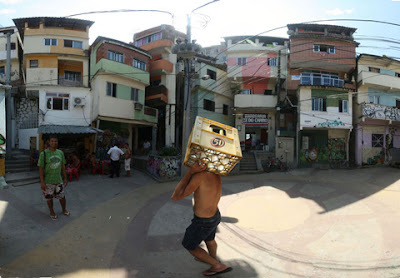 Haas&Hahn, the working title of artistic duo Jeroen Koolhaas and Dre Urhahn, have been painting the favelas of Brazil since 2006. 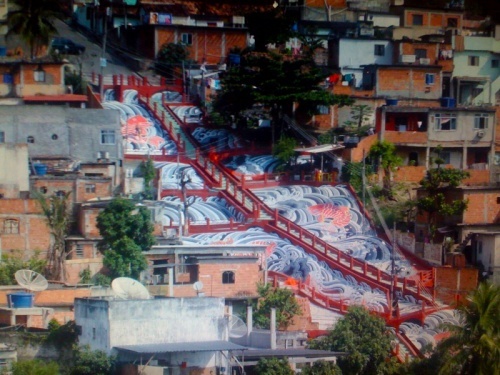 This piece, their second large painting in Vila Cruzeiro, was finished in 2008. Their site describes a bit about the process: "It was situated on a massive concrete structure, built to protect the hill from mudslides during the rainy season. 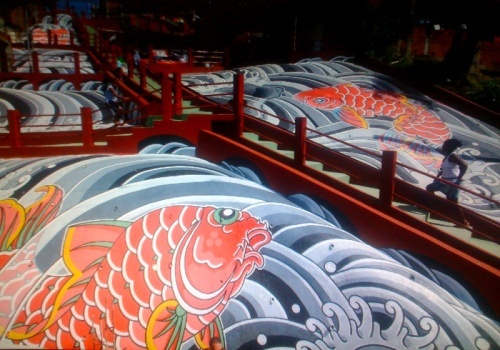 It was painted together with local youth, who learned a craft, while earning money at the same time. The traditional Japanese design was made by master tattooist Rob Admiraal." More recently the pair completed work on the community of Santa Marta. Santa Marta is a favela right in the heart of Rio de Janeiro. The homes and school that were chosen for the project site are located right at the entrance to the neighborhood, making for a striking first impression. Before the project, the homes were a ramschakle of angles and patches of colors. Haas&Hahn used a "flexible concept of colourful rays" to create visual cohesion among the houses using a pattern of rays "which can easily be expanded [to neighboring buildings]." The design included the houses around the square, part of the street, and the local Samba school. But if Rio de Janeiro is a bit too far to go for your colorful urban renewal, Haas&Hahn have a new project right here in the states. "Philly Painting is a neighborhood beautification project of unprecedented scale, set in North Philadelphia, around the Germantown and Lehigh Avenues. The goal is to mobilize the community to completely transform the commercial corridor and bring a new look to their neighborhood: A social and artistic experiment of urban acupuncture, beautification, and economic stimulus of unprecedented scale." While the project has only just started, we think it has great potential to change how people see not only Germantown but urban renewal as a whole in the United States. We are excited to check back with this project periodically to watch the progress!